The Japanese spacecraft Hayabusa 2 is now well advanced in its mission. It has sent three landers on the asteroid and took a first sample on the asteroid Ryugu. On April 4, Hayabusa 2 created an explosion to send a copper penetrator at high speed to the surface of the asteroid. The goal was to create an artificial crater to study Ryugu’s interior. Everything went well. The space probe was able to shelter before the detonation and a small camera sent further could even capture a cliché of the impact. Hayabusa 2 is now able to get closer to Ryugu to study the consequences of the explosion. The impactor has probably released a material not exposed to radiation from the interstellar medium. By observing the shape of the crater and ejectas, Hayabusa 2 should collect information about the material of which the asteroid is composed. Eventually, the mission team hopes to take a sample from the heart of the impact zone. Hayabusa 2 still has a fourth lander to deploy. This will then be the time to start returning to Earth. The goal of the Japanese space probe Hayabusa 2 is to bring small pieces of the asteroid Ryugu back to Earth. The Japanese space agency broadcast a video recorded during the maneuver on February 21, 2019. The shooting of the small projectile caused a lot of chippings and rocks to take off. 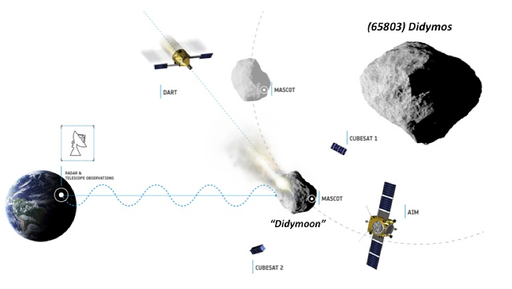 We hope that the compartment of the probe will collect enough dust from the asteroid. On Friday, February 22, the Japanese spacecraft Hayabusa 2 will make its first attempt to collect sample on the asteroid Ryugu. This operation was originally scheduled in October but the mission team preferred to take a little more time. It’s not going to be easy to take a small piece of Ryugu. The Japanese space probe must come in contact with Ryugu’s surface and then fire a small metal projectile of 200 grams at nearly 300 meters per second. The impact will raise dust that can then be collected by the robotic arm of the space probe. Hayabusa 2 will do another sample collection after bombarding its target with a high speed impactor. NASA mission OSIRIS-REx has arrived near the asteroid Bennu. For the moment, the spacecraft has not launched into the orbit of the asteroid, it is flying alongside it on a similar trajectory. The space probe will go into orbit of the asteroid on December 31st. The main mission of OSIRIS-REx is a return of samples, such as what the Japanese space probe Hayabusa 2 is doing on the asteroid Ryugu. It will however be necessary to wait until 2023 before being able to analyze this precious sample of asteroid in the terrestrial laboratories. In the meantime, the spacecraft will start its study and mapping work to select the best sampling site possible. OSIRIS-REx also has the mission to determine the resource potential of an asteroid, which could interest future miners and explorers. The Hayabusa 2 mission seems more complicated than expected. The Japanese spacecraft has to take a sample of the asteroid Ryugu to bring it back to planet Earth. The problem is that to get close you need a smooth surface that is safe for the space probe. The asteroid Ryugu appears rather rocky, which may complicate the sample collection. Asteroid exploration missions will in any case accelerate. The US spacecraft OSIRIS-REx will approach the asteroid Benou December 3, and then will return a sample. The MASCOT lander was deposited by the Hayabusa 2 space probe on the surface of the Ryugu asteroid. The little French-German lander MASCOT took advantage of his 17 hours of battery to have a walk on the asteroid. It collected valuable data on this black asteroid like coal. The data collected by MASCOT can be analyzed in the weeks and months to come. Meanwhile, Hayabusa 2 still has many operations to do around Ryugu. The space probe must drop an additional lander at the beginning of 2019, and take samples. One of them will be taken from an impact crater that Hayabusa 2 will create with an indenter. We will hear about Hayabusa 2 and Ryugu for a while. Japan is acquiring strong expertise in the exploration and collection of samples in very low-gravity environments. 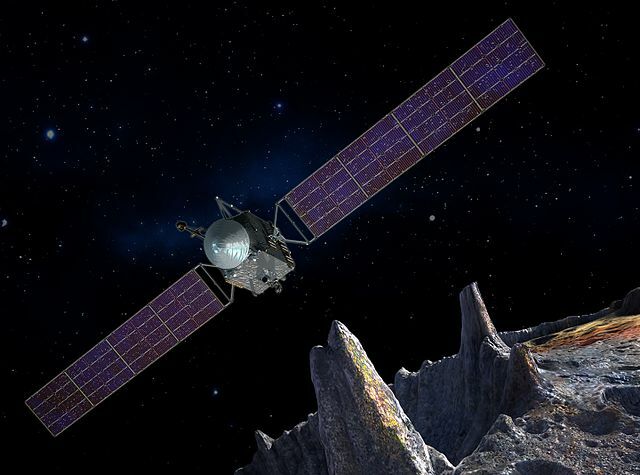 JAXA has decided to carry out the same type of mission on the Mars moons as on Ryugu. The Mars Moon Explorer (MMX) space mission should be launched towards Phobos and Deimos in 2024. The two moons of Mars are still mysterious. We do not know if they are asteroids captured by the red planet’s gravity field, or if they are remnants of a gigantic collision that would have left them in orbit. It is also not known whether these two moons of Mars have the same origin. By taking a few samples from the surface of one of these two moons of Mars, we would learn a lot. This is the goal of the MMX mission. The spacecraft must go into Mars orbit in 2025. Its orbit will allow it to observe Phobos and Deimos almost constantly for almost three years. MMX will have to scrutinize the two moons of Mars using its many instruments, then it will land on the surface of Phobos, the largest of the two moons of Mars. For its sample collection, CNES is already well involved in the mission since it will provide the infrared spectrometer of the space probe. But MASCOT’s success boosted ESA’s ambitions as the small lander completed its mission on the surface of Ryugu. 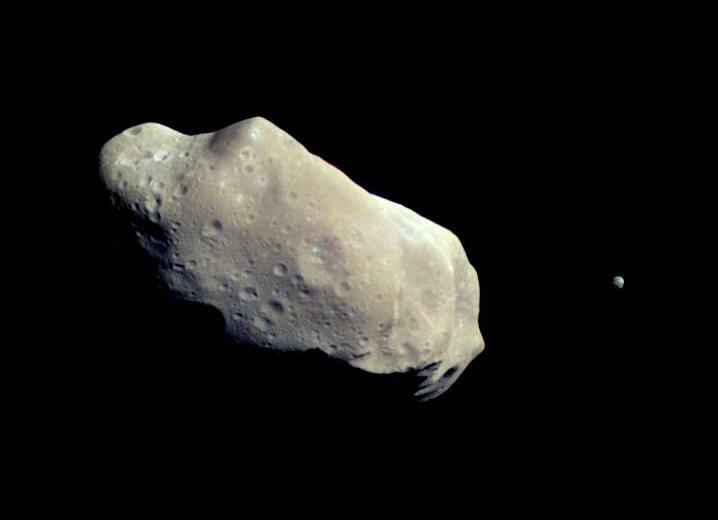 CNES, DLR and JAXA have therefore decided to duplicate the operation on the surface of Phobos. The three space agencies announced on October 3 that a new European rover will be integrated into the MMX mission. It will scout on the surface of Phobos to analyze the ground of the moon of Mars. This will optimize the sampling operations of the Japanese space probe. But this new rover will not be a simple copy of MASCOT. It should for example be equipped with solar panels, which will give it a life expectancy much longer than the simple batteries of MASCOT. The European robot could have a walk on the surface of the Martian moon for several months. It will probably also move in small leaps, which is a means of locomotion more effective than the wheels in very low gravity. The French and German space agencies are aware that this mission will be a great opportunity to explore a new world. If everything goes as planned, Japan could have the first sample from the Martian system. The return is expected in 2029 and it is unlikely that China or the United States of America have advanced on their plans by that date. But before that, it is already necessary that the return of samples of Hayabusa 2 proceeds correctly. Hayabusa 2 is accelerating its operations. The Japanese spacecraft is in the exploration phase of the near-Earth asteroid Ryugu. After its complicated preparatory approach, the spacecraft took a second approach on 21 September. Hayabusa 2 took the opportunity to deploy two small robots on the surface of the asteroid. The two rovers MINERVA have successfully landed on the surface of Ryugu. They took advantage of their descent to take some shots, sometimes a little vague because the photos were taken in motion. Their release was a high-flying operation. Hayabusa 2 descended from its working orbit 20 kilometers from the asteroid to approach only 55 meters from the surface. The two small robots will now move by jumping on the asteroid. They will transmit images and some measurements during their journey. Hayabusa 2 still has two other passengers bound for the Ryugu surface, a third small MINERVA rover and the Mascot lander. The Mascot lander was designed by CNES and the German space agency DLR. It carries many more instruments than small rovers and the release is scheduled for next month. Hayabusa 2 caused two explosions. The first occurred at altitude above the asteroid Ryugu and the second at the surface of the asteroid. These two explosions were caused by the impactor of the space probe. The idea is to dig deep into the asteroid Ryugu to analyze its internal composition. We could say that it would be enough to drill the ground with a drill as do the Martian robots, but this is very difficult in microgravity. The Japanese space agency has decided to use a hollow charge. Hayabusa 2 will start by ejecting a small module before going to shelter on the other side of the asteroid. In this module, there is a sheet of metal and a small explosive charge. When it is fired, its shock wave will deform the sheet of metal and give it the appearance of a ball. This explosion will also give a speed of 2 kilometers per second to the projectile thus formed. When the indenter penetrates Ryugu, it will leave a crater there and Hayabusa 2 will be able to take a sample from the depths of the asteroid. The asteroid Ryugu has a mass of 450 million tons. At this scale, the impactor of Hayabusa 2 will not cause a change of trajectory. Two space missions will take their samples on asteroids this year. These two missions have similar goals and schedules. This is the US mission OSIRIS-REx and the Japanese mission Hayabusa 2. These two missions have been in the news in recent days as they advance on their objectives. OSIRIS-REx was able to take a first series of pictures of its target, the asteroid Bennu. The probe is still 2.3 million kilometers away from the asteroid, it will take a few more weeks to get close to the asteroid. OSIRIS-REx is expected to arrive near Bennu on December 3rd. Before taking a sample of the asteroid, the space probe will spend a year studying Bennu. Accurate mapping will make it possible to choose the better site to take the sample. Once its valuable cargo is stored, OSIRIS-REx will make the return journey to Earth. It is necessary to wait until September 2023 to be able to analyze this sample in terrestrial laboratories. The Japanese spacecraft Hayabusa 2 has arrived in the vicinity of the asteroid Ryugu. The Japanese mission is very ambitious because it must also drop rovers, a lander and bombard its target with an impactor. These operations should begin soon. The JAXA has scheduled to drop the rovers on September 21 and to drop the Franco-German lander called Mascot on October 3. For this, the Japanese space agency had planned a general rehearsal of operations. But the JAXA announced on September 12 that everything has not gone as planned. The maneuver was to bring the probe 30 meters above the target. Arrived at 600 meters above the Ryugu asteroid, the Hayabusa 2 probe could not measure its altitude correctly. The distance measuring instrument with a laser has difficulties with the black surface of the asteroid, which apparently absorbs a little too much light for this instrument. The probe is perfectly functional but the method of approach is to be reviewed. The first serie of studies on the asteroid has already identified some of its characteristics, including an estimated mass of 450 million tons. This is enough for there to be a small gravity on the asteroid, which would be enough to bring down lander and rovers in free fall to the surface. It is hoped that JAXA will quickly solve the altimetry problems. Meanwhile, Hayabusa 2 has already sent beautiful pictures of Ryugu on which we can even see the shadow of the probe.